I am proud to announce that I have officially sold my Nissan Skyline GT-R. This means I will no longer accidentally open the passenger door to my normal car when I’m trying to go somewhere. You’d know all about my Skyline sale if you followed me on Twitter, because I announced that I was auctioning it on Bring a Trailer, where it garnered a sale price of $21,000. You’d also know all about the Skyline if you followed along throughout my last year of ownership here on Jalopnik, where I’ve done some exciting things with it, like drive backwards through a fast food drive-thru, compare it to a new Nissan GT-R, measure its horsepower at a dyno, and get pulled over twice in one night by suspicious police officers. But before it goes away for good, I’ve decided to write one more column that sums up my experiences owning one of the most famous Japanese cars of all time. There’s also a video, which I highly suggest you watch, unless you work in one of those offices where they don’t allow people to view moving pictures. In that case, I highly suggest you take a bathroom break and watch it on your phone as you sit on the toilet. I’ve now owned 21 cars in my lifetime—everything from a Prius to a Ferrari —and I’m happy to report that the Skyline easily finds itself among my top five in terms of driving experience. When I got the Skyline, I figured it would be a typical 1980s-era Nissan: it would creak and rattle, it would wallow around bumps with saggy suspension, and it would feel underpowered to the extreme. In fact, I don’t think I’ve ever been as apathetic to a car purchase in my entire life as I was when I bought the Skyline, except for the time I found out I’d be getting my brother’s old Cube. But the truth is the Skyline’s driving experience was exactly the opposite of what I was expecting. There was no wallowing. There was no slowness. There was no loose steering. This car was tight, composed, and exceptionally flat when cornering. There weren’t even any rattles. In fact, the whole driving experience reminded me of a Porsche, which I never really thought a 25-year-old Nissan would do. And while it wasn’t lightning fast by any means, I think 300 horsepower is just about the magic number for a car like this: enough to have some fun on the road, but not enough to violate every legal speed limit on earth with one four-second push of the throttle, like my old Cadillac CTS-V Wagon could. The only real drawback to the Skyline’s driving experience was its most obvious difference from a normal car: right-hand drive. I hated it. Although a lot of Americans with imported cars say they eventually get used to it, I never did—probably because I didn’t drive the Skyline very much. It was always a concerted effort to stay in the correct part of the lane, to remember that the turn signal stalk was on the opposite side, and to shift with my left hand. Admittedly, this is a minor drawback, and I’d never let it stop me from buying this car, but it’s worth noting for all of you who want to be mad JDM tyte, yo. But the excellent driving experience wasn’t the most surprising thing about owning the Skyline. By far, the most surprising thing about owning the Skyline was the attention that it received from virtually everyone I encountered. Now that I’m free of Skyline ownership, I can admit my own feelings about the car’s appearance: about a year ago, I’m not sure I would’ve noticed a silver R32 Skyline GT-R on the road. To me, the thing looks like a Maxima with circular tail lights: it blends in to the extreme, with few unique lines to distinguish it from any other boxy 1980s Nissan you see driving around. A year ago, I would’ve been more likely to turn my head and watch a garden-variety Porsche 911 go by than an R32 GT-R. But not everyone feels this way. I know this because I received an engine rev from virtually every single New Jersey resident with a Chevy Cobalt SS, or a Dodge Neon SRT-4, or an old WRX, all of whom immediately picked up on exactly what I was driving. And it wasn’t just car people: random people on the street would stop me and ask why I was driving on the wrong side of the car, whether I imported the car from Britain, and—occasionally—whether I was currently on a long road trip from Europe. I never thought I would use the phrase “I imported it from Japan” so many times in one year. In the end, I think this car got more attention than my Ferrari, and in a good way. I always hated when people would approach me at gas stations in my Ferrari and ask “How much does it cost?” or “What do you do for a living?” But when I got approached in the Skyline at a gas station, it was usually by a guy with a high-mileage E36 M3 who wanted to talk about cars, not money. There’s nothing better than a 20-minute gas station conversation with a car enthusiast where you both realize you previously owned a first-generation Cadillac CTS-V. Beyond the attention, Skyline ownership was a lot like owning any regular car. I had no trouble getting it titled and registered thanks to the good folks at Japanese Classics, who sold me the car and did all the legwork for me. It took regular pump gas, it never really had any issues, and it never required me to take unusual angles to enter parking lots (like the Ferrari) or measure the distance between two posts to make sure it would fit somewhere (like the Hummer). The only unusual part about the ownership experience was insurance: my regular insurance company wouldn’t handle it, so I had to go through Hagerty, an excellent classic car insurer with a great reputation. They issued me a policy, but there was a mileage restriction—and I had to keep the car in a locked single-car garage, which I don’t have at my home. As a result, I stored the car about 15 miles from my house. Optimistically, I paid extra for a 6,000-mile insurance policy, but with the inconvenience of the car being so far away, I barely covered 2,000 miles. 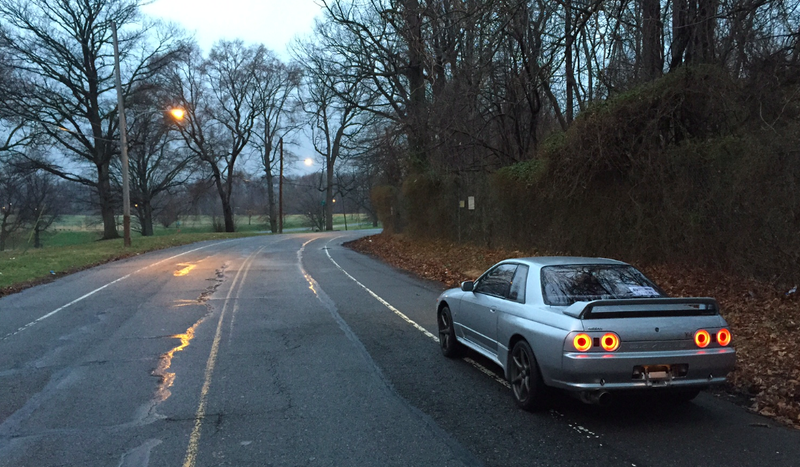 A very unexpected part of Skyline ownership came from writing about it on the Internet. By now, virtually everyone on Jalopnik understands what I’m doing: every year, I ask you to help me choose a car, then I buy one of your top suggestions, then I write about it for a year, then I sell it. But the Skyline had a life of its own on YouTube and other car websites well beyond Jalopnik, where “Skyline people” couldn’t seem to understand why I was making so many videos with the car. In fact, dozens of people accused me of “bragging” about owning a Skyline, which I found especially amusing. Prior to this accusation, I didn’t think it was possible to brag about owning a 25-year-old car worth less than a new Corolla. The reality is that I wrote about the Skyline less than I wrote about my Hummer—and “Hummer people” didn’t seem to mind. In fact, when I went to sell my Hummer on the Hummer forums, everyone was very complimentary. And so, I believe I’ve discovered something about the Skyline that holds true about the E46 BMW M3, stanced Golfs, and countless other cars: owning the car is a lot of fun. As long as you don’t go to any of the owner meetups. Many of you probably want to know what it cost me to own my Skyline for a year. I know this because many of you have e-mailed me and asked: What did it cost you to own a Skyline for a year? Well, here’s the situation: I bought the car in March for $20,995, which included all import costs. I sold the car last week for $21,000. This represents a five-dollar profit, which I used to purchase two packs of Skittles. I took out all the yellows, if anyone in the Philadelphia area would like to share. Of course, this doesn’t quite tell the whole story, but it tells most of it. My insurance policy was $1,600 for the year, but I sold the car after nine months, so I expect to see a quarter of that back. My storage fees were about $180 per month, though you probably won’t have to pay this if you’re not a city-dweller with an aging Range Rover occupying your only parking space. And… that was it. Yes, there were taxes and registration fees, just like any normal car. And yes, I put fuel into it. But the car never needed one repair, never had one problem, and never cost me anything that I wasn’t expecting. In fact, the biggest cost—beyond insurance, and taxes, and fuel, and other stuff you’d pay for any normal car—was a Dodge Challenger: the one-way rental car I used to pick up the Skyline back in March. After a year of writing about anything, it’s time to move on. I couldn’t wait to sell my Ferrari. I couldn’t wait to sell my Hummer. And now, after more than two-dozen columns and videos dissecting every aspect of Skyline ownership, I’m pretty excited to move along this car, too. But I have to say that I’m really glad I got the chance to spend a year with my Skyline, because it totally changed my opinion about this car. And the next time I see one in traffic, I promise you that I’ll turn my head to watch it go by.